This vista of the Endeavour Crater rim was acquired by NASA's Mars Exploration Rover Opportunity from the southern end of "Murray Ridge" on the western rim of the crater. 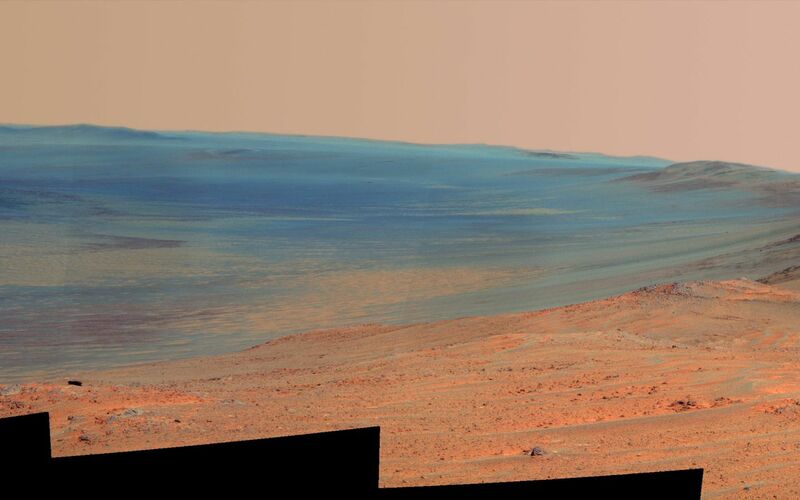 It combines several exposures taken by the rover's panoramic camera (Pancam) on the 3,637th Martian day, or sol, of the mission (April 18, 2014). It is presented in false color to make differences in surface materials more easily visible. The view extends from the east-southeast on the left to southward on the right. 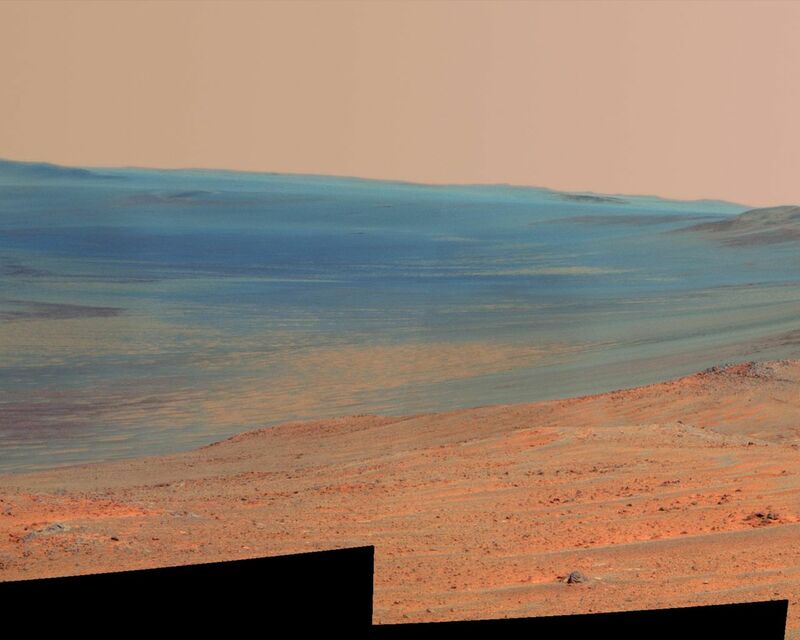 It encompasses the far rim of Endeavour Crater on the left and the crater's western rim on the right. Endeavour is 14 miles (22 kilometers) in diameter. The small impact crater visible in the distance on the slopes of the far rim is about 740 feet (about 225 meters) in diameter and is 13 miles (21 kilometers) away. The high peak in the distance on the right is informally named "Cape Tribulation" and is about 1.2 miles (2 kilometers) to the south of Opportunity's position when this view was recorded. The rim curves off to the left from Cape Tribulation in a series of peaks towards the far southern crater rim. The floor of Endeavour crater is filled with dark sand, brighter dust, and, in the distance, dusty haze. Outcrops here on the western rim are crater ejecta covered in the foreground by dark sand ripples. 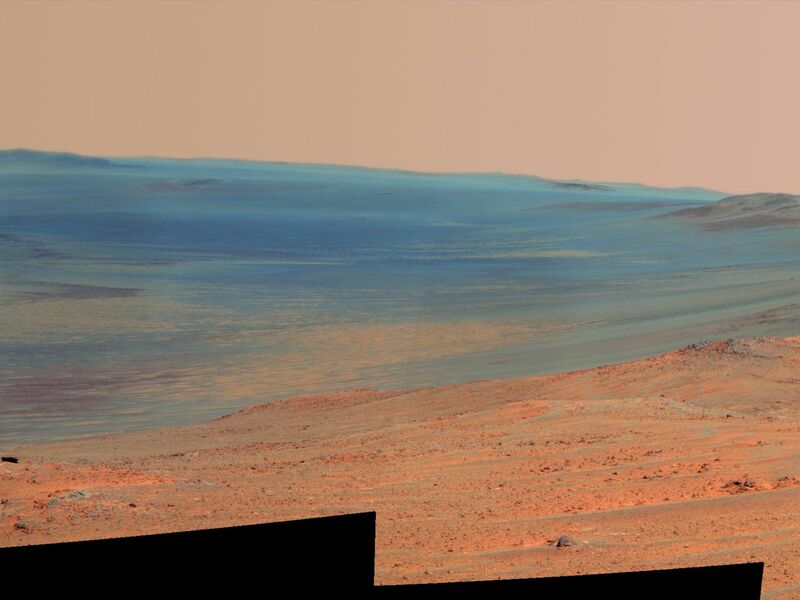 On Sol 3662 (May 13, 2014), Opportunity approached the dark outcrops about halfway down on the right side of the image. The view merges exposures taken through three of the Pancam's color filters, centered on wavelengths of 753 nanometers (near-infrared), 535 nanometers (green) and 432 nanometers (violet).